The snake boat races in Kerala are the outstanding events that brings alive the calm backwaters. 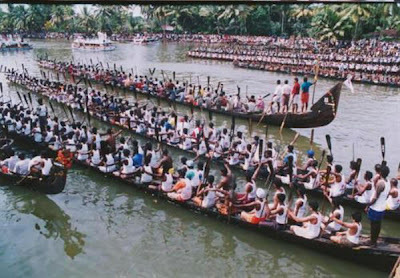 Snake boat races are held in connection with Onam, the harvest festival in August-September. Snake boat race is the largest team sport in the world and lead by colourful water parades. Thousands of people gather at lakes to cheer the huge black crafts as they slice through the waters to a spectacular finish. One of the oldest and most popular boat races in Kerala is Champakulam Moolam Boat Race which is connected to Sree Krishna Temple at Ambalappuzha. This race is conducted on Champakulam Lake on the moolam day of Midhunam, the Malayalam month. Rajiv Gandhi Boat Race, ATDC Boat Race, Neerettupuram Boat Race, Kumarakom Arpookara Vanitha Jalamela, Karuvatta Boat Race, Thazhathangadi Boat Race, Kottayam Mahatma Boat Race and Kumaranasan Smaraka Jalotsavam. Indira Gandhi Boat Race is held on the Ernakulam Lake during the Cochin Carnival in December last week.